A fashion show? Atop Mt. Pulag? You don't say! I was on my way down the slopes of Mt. 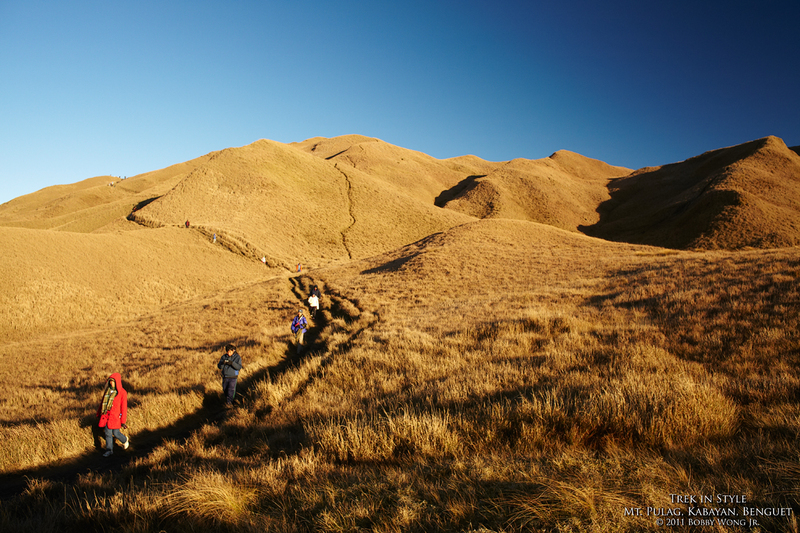 Pulag in Benguet, trekking amidst the long shadows cast by the morning sun across the parched grassland. I had anticipated this scene during my trek up the trail a few days earlier, and planned to photograph it at sunrise on the morning of my descent. But as I was fine-tuning my composition, I noticed a bee-line of trekkers on the horizon. Those trekkers who climbed the summit this morning are on their way down... and they will walk right into my composition. How lovely. I scrambled up a nearby hill, much to the horror of my mountain guide. (Sorry, guests are expected to stay on the trail and not trample the grasslands unnecessarily. But hey this is absolutely necessary!) I waited for just the right moment when my composition came together. Click. Click. Click. It was an explosion of color in a most unlikely place. The North Face, Columbia Sportswear, and the usual suspects... branded gear decked from head-to-toe... right on the slopes of Mt. Pulag. It was a fashion show like I've never seen before. Enjoy.